Ok, so a little background here. Through out my school years I was always very thin. Somewhere towards the end of high school or towards the start of university, I complained to my doctor that I thought I was too thin. He said don't worry, it was fine. Besides he said, I will gain weight as I age. Boy was he right. Fast forward to 2012, and during my physical, he noted I had put on weight again. He said it was time to start thinking about loosing some of those pounds. Here are a set of photos, the top two are me in 2012, and the bottom two, me earlier this year, 2014. Now here is an image of my progress over those two years. Back in 2012, I really wasn't happy with the fact that I was closing in on 200 lbs. I also did not have a lot of energy and I was sleeping a lot. I decided I had to do something about it. On that trip to Vegas, I picked up a Fitbit. I wanted to see my current activity level and work on improving it. It basically confirmed what I knew. I was incredibly inactive. I also got a Withing wifi scale to track my progress. I personallly don't believe that there is a get thin quick cheat, so my plan was to reduce my snacking and increase my activity. I started small, trying to get a minimum of 10,000 steps per day, or 15-30 minutes on the exercise bike in lieu of walking. As far a weight loss goes, I was just trying to keep my weight below the average. So in the graph above, I aimed to stay below the white line. The net effect of this is that I have lost 16.5 lbs over two years. Instead of putting on 2-5 lbs per year I am loosing about 8 per year. This was just done slightly reducing what I ate and increasing my activity. Over this time I have a couple of observations. I think activity has a large effect on weight loss. One thing that stands out in the graph, is that I put on weight Nov-Feb every year. This is when I am least active. At first, getting out to exercise was a chore. After two years, exercise is a habit and not exercising feels bad. By exercising, I mean brisk walking. Over time I have found my walking speed increase and my distance covered increase. To keep my hear rate up, I probably need to start running. I currently walk at a 8.5 min per km pace, and hardly find this challenging. Again, I got to this over 2 years, by slowing pushing my self. On the eating side of things I noticed a couple things. I eat when I am bored. I find a strong pull to snack when I have nothing to do. I eat when I am stressed. If things are going bad at work, I'd hit the vending machine. Starving myself causes me to over eat. I found that if I was really hungry at meal time, I would eat fast and over eat. I have noticed that it takes about 15 minutes to notice I am full. When I eat now, I try to eat until I am not hungry, as opposed to when I am full. I now try to have healthy snack that will keep me realtively full until meal time. For me, I have found a small handful of nuts when I start to feel hungry in the afternoon helps a lot. As for eating under stress, I found that getting exrcise also helps the stress, and works better than food. If I am feeling stressed out, I try to increase my activity instead of hitting the vending machine. The other change I have made to my consumption is to not drink my calories. When eating out, I'll generally order a water instead of pop. In general I try and stay away from added sugar, this includes the fake stuff. I started with the benefit, that my diet is realtively healthy, as Sylvia shops mainly for fruits, vegetables, meats and grains, staying away from the processed foods. My goal is to get my weight a little closer to my post university value. If I can get and stay down around the 160lbs, that would be ideal. So another 15 lbs to go, which I expect to take another couple years. At 175, I am still close to the max healthy BMI. Pork en mole from the Border Grill at Mandalay Bay. Breakfast buffet, Wicked Spoon, Cosmoplitan. So, from my experience (and that may not work for everyone), there is no reason to deny yourself food to loose weight. Get active, stay active, and value what you eat. As Michael Pollen said, "eat but not too much, mostly plants"
Every retailer these days seems to be offering some form of loyalty program. The question is, what do you get for your loyalty. What the retailer gets out of it is detailed purchase tracking of it's customers which it can use to optimize its' pricing. First off, if a business offers great service, I will return, loyalty program or not. I think you should too. There are two common ways loyalty programs operate, one is to offer a % discount, the other is to offer points. You need to be careful when dealing with points. I feel points are used to hide things, and make numbers look bigger and thus imply better. Points make it very hard to convert to dollar value, because of this we then just look at the number of points. Microsoft did this with Xbox Live. I can't remember exactly what the point conversion was but it was not one to one, 200 points might have cost $3. The conversion was not a nice round number easy to do in your head. I beleive this is on purpose, as they do not want people saying to themselves, "$2 for a hat for my avatar, are you nuts", but "hey 95 points I'll buy that!". Microsoft contended that this was to save on micro transaction fees with credit card companies, but if that was the case, they could have made it 1 point = 1 dollar. The only explanation I would buy would be related to currency conversion. If the points in the store were global, then they could just set the dollar value per point on a country by country basis to cover the currency conversion. So, lets look at a gas station loyalty program. Petro Canada has it's Petro Points loyalty card. The headline is "Save 5 Cents a Litre". Hey great where to I sign up? Then the small print "On the next 200L". Okay maybe that is still not so bad, that is $10 savings. So next step, how may points to get the reward? 12,000. How many points do I earn buying gas? 5 points per litre of regular gas. Ok, so to get 12,000 points I need to buy 2400 litres. Gas price today? $1.30 per litre. Ok so to get 12,000 points I need to spend 2400 * 1.30 = $3,120. Ok, so I spend $3120 and I get $10 back?? A whopping 0.32%. My AMEX card gets me 3% cash back on purchases. Petro Points? Useless. Also note, as gas price goes up, the value of a point goes down. Petro Canada offers more points for convenience store items, but those are marked up higher than other stores. You are better at buying those items elsewhere. My personal rule of thumbs is that % based loyalty programs work out better. Points are just an attempt to make lame rewards look better. With credits card programs you have to take into account annual fees. Cards with annual fees will often have higher rewards, but if you do spend enough on them you won't get any value out of them. Remember the goal of rewards is to save money, not spend money. If you are making the transaction to get the points, you are getting the short end of the stick. There is a bit of an arms war going on with the credit card rewards programs, and the merchants are the losers in this battle. Traditionally credit card companies withheld 2% when paying out to the merchant, AMEX has always been higher at closer to 5%. 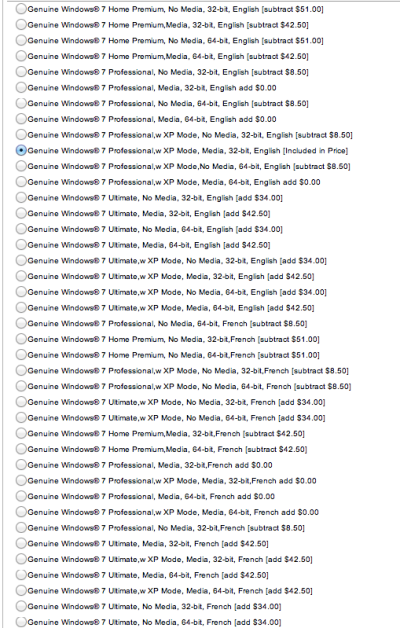 This is why AMEX is not accepted in as many places. Rewards programs came along and card companies started offering up to 1% back. The net effect was to split the merchant card fee between the bank and the customer. You spend $100 at the retailer, the retailer gets $98, the bank keeps $2 and from that gives $1 to you. As banks competed for customers, they want to push those cash back numbers higher, but they don't want to take that from their bottom line, so they increased the hold-back to the retailer. Now, one would imagine that the retailer would just stop accepting the cards, just like they don't accept AMEX. The banks however, stipulate that the retailer must accept all cards or none. For example, if the retailer takes VISA then they have to take the high fee VISA cards as well. Those are just a few things to keep in mind when you go spending your hard earned money. Yet another 0 day exploit in Java. If you have not disabled Java in your browser, do so now. It's pretty straight forward to do in Safari, and pretty painful in Chrome. Best thing to do is to Google for instructions. Go to Java.com to see if Java is running. Last month the US Department of Homeland Security advised users to uninstall Java after another 0 day exploit. Oracle has run Java into the ground, their security updates even try to trick you into installing the Ask toolbar. If you don't need it, uninstall it. Almost no one need to have Java running in the browser, so everyone should disable it there. It is Java in the browser that poses the greatest risk, as you can get infected by visiting a website. If Apple and Facebook developers can get infected what chance do the rest of us stand? Glad to see Apple somewhat change its mind on EPEAT. The question remains though, will they continue down this path of making their products non-repairable and non-upgradeable. I was disappointed to see last week that Apple was no longer going to produce products in accordance to the EPEAT standard. It appears that the reason they have dropped EPEAT compliance is their recent move that make the latest products un-repairable and un-recyclable. I really hope that Apple will back away from this new trend of gluing everything together. They are doing it to make everything as small as possible, but I think we are giving up too much to take an extra couple millimeters off in thickness. According to the folks over at iFixit, the new Macbook Pro Retina is pretty much unserviceable. Even the battery is glued in. There is no reason a laptop should not last 5 years, but a laptop battery will not. Mine battery lasted two. While I am not allowed to replace it myself, they did replace it for me. The new battery cost $120 and they did not charge me labour (I did subtly mention that I would have replaced it myself if they had not used proprietary fasteners). So what does all this mean? It means that more hardware is going to get tossed prematurely becuase a simple replacement or repair cannot be made. You can really extend the life of your laptop, but replacing the battery, upgrading the hard disk to an SSD, adding more memory etc. You save a little money and the earth is polluted a little less. I really hope Apple has second thoughts on this. Last night I saw a very interesting documentary about customer service on CBC, it is also available online here. The documentary starts by showing how some customers behave badly to those who are there to serve us, and then goes on to show some examples of poor customer service from the corporate side. Watching this show brought several thoughts to mind. Firstly, call centres. The way that many of these are set-up is a recipe for disaster. The people that you end up talking to do not have the power to do anything, and the whole organization is set-up to prevent you from getting to anyone who can help you. In this show you see an agent try to deal with an irate man who wants to know when when he will get his computer. The agent has no information in the system for that account as to when the computer will be ready, and has no way to appease the customer. She cannot get him to someone who can help, and is left to her own devices to ending the call. The real problem here is how that computer company structured its' business model for support. Like many things in this world it all comes down to money. Customer support costs money, and a corporations selling goods or services has to divide up the revenue they receive into many different buckets (salaries, cost of materials, profits, customer service). Those companies with bad customer service have either not charged enough for their product, or have chosen unwisely to underfund customer support. We as consumers have a role to play in this as well. In the PC market, margins are notoriously thin as consumers will quickly move from brand to brand over mere dollars difference. This leaves little room for the supplier to actually provide decent service. I recently made the switch to Apple, and I can say that I have no intention of switching back to PCs anytime soon. The reason for this is mainly service. I have had to have a couple of products that I have purchased repaired or replaced. In one case under warranty, and in another out of warranty. The service is stellar. They listen to your problem, do their own diagnosis and offer a solution. They do not try to minimize the problem or explain it away. If you need to get in touch with someone at Apple, it is super easy, by email, phone or in store. We can solve the customer service problem by being loyal to the companies who provide great service, and abandoning those that do not. And yes, great service is not free, but it need not be expensive either. In the end you do get what you pay for, and some things are to good to be true. Take into account the price, service, support and reviews. My experience is that if you pay a lot for something you do not necessarily get value, but if you pay bargain basement prices you are sure to be disappointed. Corners are being cut somewhere to get to that price, and if you cannot figure out where, then be careful! This week's news about Yahoo's CEO making an 'inadvertent mistake' on his resume has been an interesting read. The reaction of both Mr.Thompson and the Yahoo board make it appear that they don't or don't want to grasp the seriousness of the issue. The trouble is not whether or not Mr. Thompson needs a computer science degree to run Yahoo. It is about integrity. No one is going to take the misrepresentation on the resume as an inadvertent error. A degree take 3 or 4 years of your life to achieve and a lot of hard work. You are not going to forget that you got a degree or some how imagine that you earned one. Claiming a degree you have not earned strikes at the heart of a persons integrity. If you are willing to lie on your resume, what else are you going to lie about? Lying on the resume is usually sufficient cause for dismissal, and this should be the case here. Given the reporting on the subject, I suspect that Mr Thompson added this degree on his resume earlier in his career. Probably not wanting to be caught in a lie he left it there. Even though he may have successfully run Paypal in his tenure there, like plagiarism, claiming a degree one does not have is a very serious ethical problem. Mr. Thompson, needs to step down, remove the CS degree from his resume and look for a new job, standing on his past achievements, not imagined ones. If he was a successful as it appears at running Paypal, he should have no problem finding work. The one I am referring to, is the model where by a business makes it super easy to sign up and difficult to cancel. Most businesses now make it super simple to enroll. You sign up on the website, and voila you are done. If you need to change your address, credit card number or sign up for more features, again you can do it simply and easily on their website. If however you want to remove services or in any way decrease the amount of money you spend with them there are no visible clues as to how to do it. For example. I recently subscribed to The Hill Times. It's not a bad paper, but I wasn't reading it enough to justify the cost. Via their website account control panel, I could update my credit card number, update my address, subscribe to other publications, but nowhere to be found was a cancel button or a description about how to cancel. I entered 'cancel' into their search bar and got zero hits. There was no information on their FAQ page about how to cancel. I was left with selecting a phone number off the contact us page, and working my way through to someone who could cancel my account. Another example, a Rogers sub contractor contacted me last night with what appeared to be a good deal. He said I was paying $17/month for my iPad data plan. There was a new one that was $6 if I used less than 10mb in a month, but would revert to 17 if I used more than 10mb. It seemed like a good deal and I said go for it. Before the call was up, I asked to confirm that the 17/month included taxes ( I pay 15+ tax which is 16.95 ). They told me that it would now be $17 plus tax. So, not a good deal considering most months I would be over 10mb. I asked that I be left on my original plan. They said no problem. A couple hours later I received a confirmation email of my new plan. It has taken me close to an hour on the phone with 5 reps to find out that my SIM cannot be reverted to a pre-paid plan form the new post paid plan. So that brings me back to the point of my post. It was easy for them to convert me from pre-paid to post-paid but they can't go back. As an engineer, I know that this is not a physical impossibility, this is an accounting/IT impossibility. They have designed the system so that you can't go back to a lower cost plan. You encounter the similar issues with monthly services. When you sign up they will immediately provide you service. But when you try to cancel, they can't possibly stop the service that day and pro-rate you bill. You have to stick it out to the end of the billing cycle. Rather convenient for them. Not every business is like that. One of the selling points for moving my blog to Squarespace was the fact that they make it easy to cancel, and they allow you to export you data at any time. Without those two selling points I would never have made the jump. In the future I will be looking for the account cancellation link for any new service I may be looking to sign up with. I assume that businesses think that since they are losing a customer they might as well give up trying, but they seem to forget a customer may eventually come back. To me this roach motel model pretty much ensures that they will lose the business for good. I have several email addresses and several devices. I have IMAP set up for every account except for my Live mail account. I went out of my way to set up IMAP everywhere because of the fact that once I read an email on one device, it will get shown as read on all the others. I can also file emails and it will get updated everywhere. So, the only hold out has Live Mail. I noticed that iOS now updates the read status of Live emails, so I thought that Live Mail must have added IMAP, but when I searched the web I could not find the settings. So, I tried the next best thing, I spied on the web traffic. I installed Wireshark on my computer and configured the computer to be a wireless hotspot. I the configured the iPod to use the hotspot I just created. This way I could see all of the traffic to and from the iPod. To my surprise, when I looked at the traffic, it just looked like normal https web traffic. As a sanity check, I checked the email on one of my IMAP accounts, and as expected, I could see the IMAP traffic. So it appears that Live Mail still does not use IMAP. Instead, it looks like There must be some https based protocol for interfacing to the Live Mail servers, and it appears that Apple has implemented this on iOS. So, as a result, I am put of luck when it comes to configuring Postbox to use IMAP on the computer. As they frequently do, Sylvia and Emilia went to the High Park zoo. Today they happened upon a very special occasion. They saw a new born Llama. The baby was just 1 hour old. With the budget cuts, the zoo could be closed somewhere around June of this year. We'll certainly be sad to see it go. Emilia goes to the zoo a lot. We have been there plenty of times as a family, but Sylvia takes her there a lot during the week. Having switched from Windows to the Mac, I have noticed the subtle and not so subtle ways the Microsoft and Apple business models differ. The first thing that struck me was how Microsoft makes every effort to never brake any 3rd party software. Apple on the other hand is very quick to depricate underlying technologies and if you don't update your software it will be broken. More on that another day. The other day I had to buy a new PC at work, and what struck me was the number of SKU's Microsoft offers. Here is a screen shot of the list, and not all of it fit on the screen. How many SKU's does apple offer? Two. Far more sensible. The latest hot topic is online piracy and the internet. To start with let's just get it out there. Piracy, aka stealing is wrong. Copyright infringement, and theft are illegal, and there are laws on the books to deal with it. So the question becomes, is there something special about theft on the internet, and should we put in place new laws to address it. In the physical world, we had a similar situation with the 407 electronics toll road. Here we had theft, people driving the highway, but refusing to pay the bills or hiding their license plate so the system could not record their use of the highway. So, we have ways of addressing and punishing theft, but for the 407 they created a new system. The 407 was capable of essentially putting a lien on the car, and the owner would not be able to renew their ownership which was required every 1 to 2 years. This would seem reasonable, except for the fact that the 407 made so many billing mistakes. They charged the wrong car, sent invoices to wrong addresses, failed to record payments, and as a result many innocent people were caught up in the system, and could not renew their ownership. Essentially they were not permitted to drive their cars. Eventually the 407 was told that they would no longer be able to prevent owners from renewing their licenses. Large content holders are looking for similar actions to be taken with the internet. They are looking to ban people from accessing the internet (3 strikes laws), they are looking to takes sites off the internet (DNS redirect in SOPA and PIPA), and they seek to do this without court oversight. They would like to be the sole determiner of copyright infringement. It is a lot of power, and if history teaches us anything, with power comes corruption. We all know Napster was a problem, they are now history. Content companies should be seeking legal action against infingers, and punishments should be reasonable (A million dollar settlement agains a single person for sharing 24 songs is not reasonable). If content companies were suffering large losses, there may be cause for concern. However their does not seem to be any evidence of that, in 2009 Hollywood had the biggest box office take in history, while the rest of the economy was getting trashed. So again, piracy needs to be dealt with but the content companies do not need a "nuclear option". Content creators have been in fear of every new technology, and their fears have never come true. I guess it could happen this time, but I doubt it. Have a read of this article. And hey, the industry has been caught infringing copyright. They were republishing music on mix CDs and not paying the artists. They settled for $50 million without admitting any wrong doing. Well, this past weekend I upgraded my Mac Book Pro, and put in a SSD. All I can say is wow! I knew it would speed things up, I had no idea it would be this fast. If you are wanted to extend the life of a computer it is a worth while upgrade. SSDs have been around for some time, but I never made the jump becuase of the price. OWC is now offering a 120GB drive for $189, and it seems to have decent reviews. The other reason I hesitated is that fact I have 300MB of data on my Mac, and getting a 500+ SSD is out of the question due to price. Fortunately OWC offers a kit that alows you to take out the optical drive and mount a 2.5" drive in it's place. The upgrade itself went smoothly. Swapping the hard drive is really easy in the Mac. Getting the optical drive out is a touch more involved but not really much more difficult. It took about 1/2 hour to change out the hardware. I put the SSD where the HDD had originally been installed and moved the HDD to the optical drive bay. I had a couple of problems getting the software the way I wanted it. I moved my home directory off the boot drive and onto the HDD. What I overlooked was moving the hidden "Library" directory in my home directory. The other problem was an issue with Parallels. It did not like the missing optical drive. It saw it was gone, and popped up a message saying it would disable it. But eventually the VM would grind to a halt. To the Mac it looked like Parallels was using 100% of the 1 core I allotted, but in Windows it thought it was only using 10-20%. Windows at this point would run so slow it was unusable. Once I went into the VM configuration and removed the optical drive device, It was ok. I also had to fix the boot order when the optical drive was removed. For some reason Parallels wanted to put network boot ahead of the hard disk, which meant that my VM would not boot. Now everything is installed and configured, and the core2 duo machine is screaming fast.